‘He unrolled the scroll and found the place where it was written: “The Spirit of the Lord is upon me, because he has anointed me …”’ (Luke 4:17-18). Any Bible reader will want to know where this ‘is written’, and will be grateful for an edition of the Bible that provides a marginal note ‘Cited from Isa 61.1, 2’. The NRSV Cross-reference edition contains all the references of this kind that anyone could wish for. It was compiled in about four years across the turn of the millennium by Martin Manser, an expert indexer who is a veteran of many works of reference, and a dozen or so biblical scholars working under his guidance. The consulting editors, responsible for adjudicating in obscure cases, were Professor Bruce M. Metzger and myself. It was an interesting but rather exhausting task. Besides the obvious need to identify passages of the Old Testament cited in the New, this edition also contains references to parallel passages (as, for example, between Matthew, Mark, and Luke, the ‘Synoptic’ Gospels), and references from one book to another within the Old Testament, Apocrypha, or New Testament. But the Preface mentions also ‘passages referred to for similarity of subject, idea, or expression’; ‘passages referred to by way of explanation or illustration’; and ‘historical and geographical references to names of persons and places’. With these items included, this edition becomes a mine of useful information, covering much of the ground of an average concordance and even of an encyclopaedia of biblical themes, people, and places. The many thousands of marginal cross-references pick up allusions you would have at your fingertips only if you knew the Bible by heart. A good example of a ‘synoptic parallel’ is the Transfiguration story at Mark 9:2-8. The margin tells us where the story occurs in Matthew and Luke (there is no Johannine version): Mt 17:1-8 and Lk 9:28-36. But that is only the beginning. The story begins, ‘Six days later, Jesus took with him Peter and James and John …’ and the margin tells us of the only other places where these three appear together: Mk 5:37; 14:33; Lk 8:51. No concordance would tell you that. When Jesus is ‘transfigured’, in verse 2, the margin points to 2 Cor 3:18, where the word does not occur but the idea does: ‘all of us, with unveiled faces, seeing the glory of the Lord as though reflected in a mirror, are being transformed into the same image from one degree of glory to another’. When Moses and Elijah have appeared, Peter addresses Jesus as ‘Rabbi’, and the margin says ‘See Jn 1.38’. The word ‘See’ refers us to a place where there will be a list of other instances of this form of address (about fourteen references): such frequent items are collected together in just one place, and then referred to by this formula in every other place where they occur, so that the reader can quickly find the full list. The same thing happens later in the passage when the divine voice says, ‘This is my Son, the Beloved’, where we find ‘See Mat 3.17’, an inventory of the other New Testament places where this title of Jesus occurs, including Ephesians, Colossians, and 2 Peter. Peter in his confusion proposes to make three ‘dwellings’. The Greek word here is the same as the word used in the Greek Old Testament for the ‘shelters’ in which the Israelites were to live at the feast of Tabernacles (or Booths). The margin sends us to Neh 8.14-17 where the regulation about this—still observed by orthodox Jews—is referred to. For ‘he did not know what to say, for they were terrified’ (verse 6), the marginal reference ‘See Mt 14.26’ reveals a whole theology. It takes us first to Jesus walking on the water, when the disciples ‘were terrified’, but from there refers us on to Mt 27.54, where the centurion and those with him were terrified by the rending of the temple-veil, the opening of the tombs, and the earthquake, at Jesus’ death; then on to the terror of Zechariah when he saw the angel in Lk 1.12, and of the shepherds at the sight of the angels in Lk 2.9. We see how the appearance of God induces fear, but also how consistently he says, ‘Do not be afraid’. Missing here is Mk 16.6, where the women at the empty tomb ‘said nothing to anyone, for they were afraid’—though that passage itself is cued back to Mk 9.6. Anyone wanting to write a sermon on holy fear need look no further than these marginal references for inspiration! The basis for the cross-references was the body of references assembled for the (now almost forgotten) Revised Version in 1898, which was an astonishing testimony to knowledge of the Bible in a pre-computer era. But the RV cross-references have not simply been transferred mechanically. They were in any case patchy, with some books much more lightly annotated than others, whereas here the aim has been consistency in the ‘thickness’ of the cross-references. Further, the basis for references is normally the English text, and the NRSV does not follow the RV in striving always to translate the same Hebrew or Greek word by the same English one, so an exact transfer would not have been possible. Sometimes the compilers have chosen to cross-reference by Hebrew or Greek even where the English differs—the Preface points out that in Lev 11.5 ‘rock-badger’ is cued to Ps 104.18, even though there the same Hebrew word is translated ‘coneys’. Similarly, cross-references from the New Testament to the Old sometimes rest on the Greek version of the Old Testament, because that is what the New Testament writers are quoting. Where that happens, ‘(Gk)’ is added to make the point clear. The NRSV Cross-reference edition comes in two versions, one with and one without the Apocrypha. Modern technology has made it possible to eliminate all references to the Apocrypha in the ‘canonical’ version. But many readers will want to have the version with the Apocrypha whatever they think about it theologically, or else they will miss out on a mine of additional information. It is a cause for regret that it was not possible to include cross-references to non-biblical texts: thus Jude’s reference to 1 Enoch (Jude 14-15) could not be included. But to do so would have opened the doors to so many other possible cross-references that the task would have become unmanageable; and questions of criteria would have loomed even larger than they already did. This is a reworked version of an article originally published in The Church Times in 2003, and used by permission of the editor. 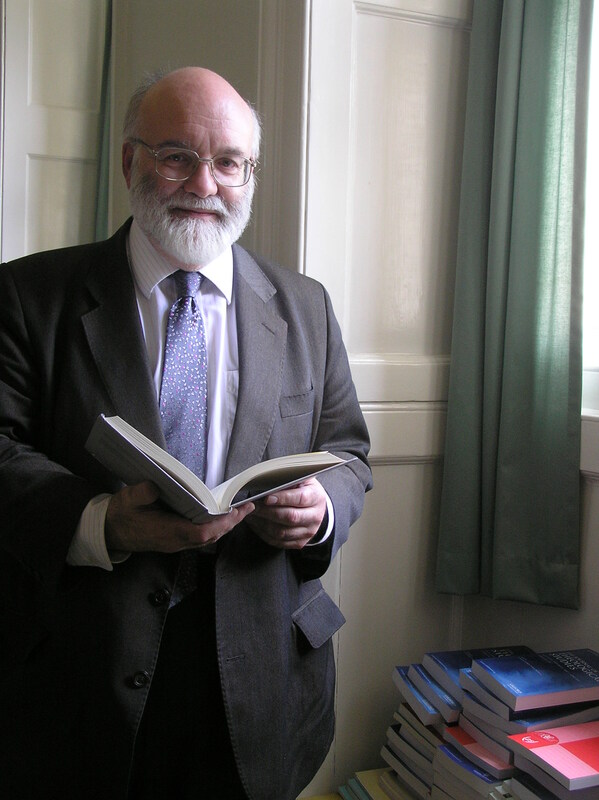 John Barton is Emeritus Oriel and Laing Professor of the Interpretation of Holy Scripture in the University of Oxford, and a Senior Research Fellow of Campion Hall, Oxford. It’s a shame the computer technology was used to exclude the cross-references to the Apocrypha in editions not containing it. There is no reason to hide insight from those who choose not to have what is not canonical available, because that distorts the understanding such people are permitted to have. Editions of the Bible tailored to readers’ requirements are acceptable, but should not extend to reinforcing ignorance.